Capacity Building Programme to District Officials, National Achievement Survey(NAS) Operational Manual, Module of test administration: NAS Operational Guidelines, NAS Training Manual, Survey of Learning Outcomes, NAS Module of Test Administration for Field Investigators. The National Achievement Survey (NAS) is a representative sample of schools from all districts in India aimed at understanding the health of the education system in government and government aided schools. Findings from the NAS will be used as inputs in policy, planning and pedagogical interventions to improve student learning outcomes.The National Achievement Survey (NAS) is a representative sample of schools from all districts in India aimed at understanding the health of the education system in government and government aided schools. Findings from the NAS will be used as inputs in policy, planning and pedagogical interventions to improve student learning outcomes. NAS is not designed to assess the individual student performance. National Achievement Survey (NAS)- 2017: Please find enclosed herewith the Govt. Memo. 6618/SE Prog.1/A2/2007-1, S.E. Dept, dt: 08-09-2017 received on constitution of observers for NAS test to be conducted for classes III, V and VIII on 13th, November, 2017 in your district. Please find the attachments herewith as mentioned below. 4. NAS (Classes III,V and VIII)-District Training Workshops (pdf). Sub: NCERT, New Delhi - Conduct of National Achievement Survey (NAS) 2017 for Classes III, V and VIII - Capacity Building Programme to District Officials by NCERT at Bengaluru - Deputation of the concerned - Reg. TA/DA of the participants shall be borne by SSA and the stay of the participants at Bengaluru shall be borne by NCERT. DEOs may meet the expenditure incurred on TA/DA from the available SSA funds. The DEOs along with the second officer (Nodal Officer / MIS Coordinator) from the district shall attend the Training Programme without fail. 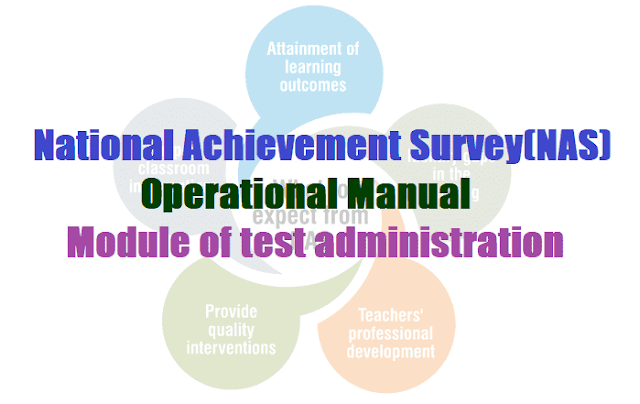 • The NAS is linked to the learning outcomes. • Classes 3, 5 and 8 are being assessed in the same academic year on the same day. • The learning gaps will be identified in all the districts of the country. • Pedagogical interventions will be provided at district level in the same academic year. • NAS will help in capacity building at the State/UT level by training a cadre ofState Level Master Trainers (SLMTs). • Auto-generated reports will be available at district level. NCERT has initiated the National Achievement Survey (NAS) for 2017 in Classes III, V and VIII, subsequent to completing four rounds of the survey for government and government-aided schools in key curricular areas viz. Language, Mathematics, EVS/Science and Social Science. For NAS 2017, national school sample drawn through the Population Proportionate to Size (PPS) methodology, includes nearly 3.6 million children from 120,000 schools spread across all districts in India. • Pedagogical interventions will be provided in the same academic year. NAS Assessment AreasIn NAS, assessment will be done for classes III and V in Language, Mathematics & EVS and for class VIII in Language, Mathematics, Science & Social Science. NCERT has developed two sets of test booklets (Test Forms 1 and 2) per class as exhibited in figure 1. There are total 45 questions in Classes III and V and 60 questions in class VIII in each test form. The assessment time for each class is 2 hours approximately. Apart from this, to derive an understanding of factors influencing learning, students contextual and school background information is being collected through three questionnaires–Pupil Questionnaire (PQ), Teacher Questionnaire (TQ) and School Questionnaire (SQ).Internationally accepted technical standards and practices are being adhered to while planning, designing and implementing of NAS to ensure its robustness and sustainability. NCERT is working in close collaboration with the states and other stakeholders to strengthen and to ensure timely implementation of the National Achievement Survey. Besides understanding the learning level of children, the NAS is building the systemic capacity in learning assessment at all levels in the country. Examinations:: An examination is a formal test of an individual student's knowledge or proficiency in a subject on the curriculum. The results of examinations apply to individual students, enabling them to progress through school or apply for further education or employment. Taken together, examination results provide an overall snapshot of students' performance at the end of a school year or course of learning. Examination results do not indicate the reasons behind high or low achievement of students. Assessment Surveys:: Assessment Surveys provide a measure of learning across a representative sample of students. They allow classification of students at a specific grade level by their ability (what students know and can do) in different subjects on the curriculum. National Assessment Surveys provide a "Health Check" to the education system by analysing achievement based on a range of background factors (school, home, teachers). They potentially enable policy makers and practitioners to address the challenges to enhance student learning. It has been decided to conduct the National Achievement Survey (NAS) on 13th November 2017. Kindly note the following in this regard for further necessary action at your end. In order to monitor the progress of preparation for NAS, a tracker has been created and communicated to you. All States are requested to update their progress on the NAS tracker which is shared via my email. The States are requested to adhere to the deadlines of the tracker and update the status on regular basis. It is observed that 7 States/ UTs have not even started filling the NAS tracker. These States/UTs are Daman & Diu, Delhi, Goa, Jammu & Kashmir, Lakshadweep, Meghalaya and Uttar Pradesh. The States would have received the English version of test items with the translation guidelines by 26th August 2017. The States are requested to translate these items in regional languages and send it back to NCERT on or before 8th September, 2017. The States should maintain the confidentiality of test at all levels. On receiving the original test items, State SCERTs are requested to sign a confidentiality certificate signed by the Director SCERTs and send it back to NCERT by 31st August. This certificate may be signed by either the SSA SPD or Director SCERT as authorized by the State Education Secretary. NCERT would vet the translated items during the trainings of Master Trainers for NAS. NCERT will share a detailed schedule and procedure of vetting of these items during the workshop with the respective States. States and UTs are requested to complete the physical verification of the sampled schools as per the timelines given on the tracker and upload the same on the tracker. Kindly obtain completion certificates for verification from districts and ensure that the same is reported on the tracker on or before 10th September, 2017. The number of schools replaced during the sampling should be updated on the tracker separately for grades III, V and VIII. NCERT conducted a few District level trainings and it is found that the State level capacity needs to be augmented further to ensure percolation of all communication/ guidelines/procedures/processes, etc. to the districts/blocks/ schools. Therefore, it is decided that NCERT will hereon conduct State level Masters Trainers (SLMTs) training in a very detailed manner. The SLMTs are expected to in turn, ensure complete capacity building at District level, Block level and School level. States and UTs should translate the training material in their regional language for Block level training and training of field investigators on or before 15th September, 2017. All OMR scanning processes should be finalized by the States and UTs as per their own financial norms, however the technical requirements of software will be prescribed by NCERT. We would like to communicate this to everyone that MHRD, in no way supports or recommends any vendor throughout the implementation of NAS. PAB has issued funds for the year 2017-18 for the training of teachers under LEP. It is expected that the States and UTs would have begun training of teachers, orientation of parents and awareness regarding the same. States are requested to share the progress or initiatives related to the same. The National Achievement Survey 2017 is focused at assessing the system for improvement intervention and is not aimed at assessing an individual child's capacity. It is compulsory for all States and UTs to participate in this survey which is a sample based survey with District as a sample unit. It is again reiterated that there would be no ranking of States and UTs. The Survey should be seen as a tool to assess the health of the system and making policy interventions for the same. A one to one meeting with regard to the preparations by the States and UTs shall be arranged from the last week of September onwards, wherein it is expected that the State Education Secretaries and SPDs shall participate and make presentations on their progress. States are requested to be prepared for the same and complete all activities related to NAS. States should also collect status and be ready with data on Aadhaar and UDISE with regard to the schools and Districts. For any queries related to NAS, the NAS control room can be contacted. The phone number for the same is 011-26865909. Pre-Survey Roles and responsibilities of SPDs and SCERT Directors are attached at Annexure-I for understanding further necessary action at your level. Calendar of activities for NAS till 15th September is at Annexure-II.